If you haven't already entered, the cut-off time is Wednesday 31th March at midnight EST and you can submit your entries HERE. Just Add Ink #10 - A Colour Challenge! We're into the double digits this week - the big one-o, I can't believe it! This is a perfect opportunity to say thank you to all of you that leave kind comments and encourage us to keep it up, and thanks to all you ladies that play along and dazzle us with your creations! We wouldn't be inspired without you! You may have noticed a few articles popping up now and then on Just Add Ink. If you haven't already had a look at what's on offer, follow these links to the posts - My Space which features the gorgeous craft space of Jodene Tripp, Can't Live Without... Kitchen String!, and some of our Design Team share some of their top tips in While The Glue Is Drying. You'll also notice that our sidebar has a new widget labelled Ask The Design Team - this is so everyone can post suggestions about challenges, tutorials, topics to cover etc, and also to ask any questions of the Design Team. Maybe you have a question for a particular DT member, or perhaps you'd like to see a certain tutorial...? The floor is yours - we'd love to know what you'd like to see! 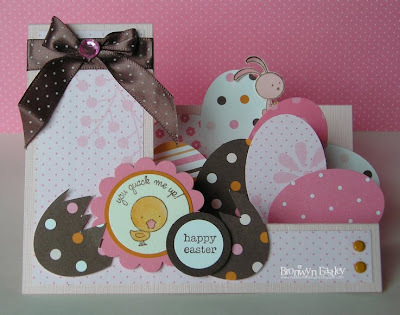 Make anything you like using the above colours - a card, scrapbook layout, 3d object, etc. Please use the keyword JAI10 when uploading to public galleries. Mr. Linky will close Wednesday 31st March at 23:59EST. Be here on Thursday 1st April to see our Top Picks. Firstly, congratulations to everyone for thinking outside the square with this weeks sketch challenge! Each and every one of you brought something completely original and beautiful to the table, and the entire design team at Just Add Ink had a very hard time picking the top 5. Thank you for playing this week at Just Add Ink! We hope to see you tomorrow for our latest challenge - what will it be? A colour combo? Another sketch challenge since you love them so much? Something completely random?? You'll have to pop in at midnight to find out! While The Glue Is Drying - Top Tips! We asked our Design Team to tell us about some of the really simple things they do to make life easier when crafting, and here are some of their responses. We'd love to hear from all our readers too, so leave us a comment if you'd like to share your hints! The internet. Google is fantastic if you're looking for a certain set. Split Coast is okay, but you have to sift through a lot of creations. I think JAI is my fave place (sorry, biased!!) for inspiration, I'm blown away with the entries we're getting. They're all top quality. * I have a folder on our computer to save photos of cards that I'd like to CASE (including the crafter's info so I can reference them if I publish my cards on my blog). * I also take photos of all the cards I make - sometimes a simple technique I used months ago is exactly what I'm looking for. * Being on a Design Team means I’m constantly seeing heaps of brilliant work too! All over! I keep my favourite blogs in Google reader and have tags like "layout", "colour combo", "ribbon idea" etc so that when I see something I like, even if it's only a small element of the card or scrapbook page, I file it accordingly so I can refer back when I need to. I love looking through magazines, but these can be very expensive, so blog surfing is probably the best and easiest way to find inspiration. There are so many fantastic ideas out there. I get inspiration from other blogs, magazine ads and fabric shops… these last two especially for colour combos I haven’t tried before. What do you do when you need to make a quick card? Again, the internet. A quick CASE, otherwise it's all paper, glue and disaster. I don’t do quick! I always get sidetracked and spend a lot longer than I should! So when I make a card that I really like, I make a few of them. Some go to be sold, one stays to be displayed, and a couple go into my card box – cards that I’m keeping to give. Make one that I have made a million times before in different colours and stamps! I have a few "go to" designs that I love and use repeatedly. * I have also been known to case myself and use the same layout with different sets and colours. * This is also an organisation tip - have a sketch/colour combo book handy. Just print out sketches and glue them or you can hand draw them into a pretty notebook or folder. When you are stuck just bring out the sketches and colour combos and off you go. I often CASE myself going for a tried and effective card and just change it a little. What organisation hints can you share? * Check out K-Mart's tool section! I have containers for everything - my most recent purchase was a clear box with compartments to put all my alpha's - so any spare letters I might have I put them in there for a quick fix. * I have manilla folders to put my scraps in - they are colour coded - blues, greens, red, pink, orange, yellow, Kraft (yes, I have one just for Kraft scraps), black/white combined. * I have a big 12x12 bag for SU! DSP scraps, another for contraband DSP. * Use formula tins for bins - they are wonderful, cheap and do the job. It's amazing how much these things hold. They're fun to decorate too. 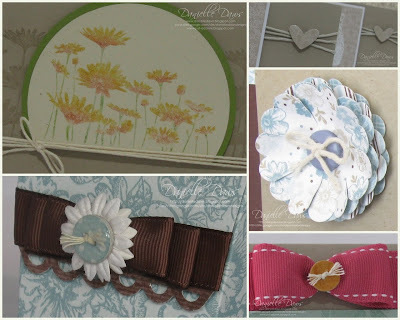 * I do the folder thing too, Card Inspiration, Scrapbooking Inspiration, Make These... I also have an art journal with passport-sized prints of my computer saves for when I can't get to the computer, or I’m out creating at friends places. * Have a regular clean out. If you haven't used it in a year, turf it or ebay it. I label my stamp sets with those small circle stickers - the removable kind you get from a newsagent or Officeworks. All sets have the title printed on white (easier to see), hostess sets have a gold sticker on the left hand side, retired (or not available) sets have a silver sticker on the right. Current sets (non hostess) have nothing. So as soon as a mini finishes, I just add silver stickers to the sets that are retiring. It just means that when I'm looking for ideas for workshops, I can skim past the retired sets easily. I keep a snap lock bag of scraps of each colour filed next to large sheets of the same colour so that I can head straight to the scraps bag to look for a piece that I need, then if there's not a scrap big enough for what I need, only then do I chop into a new piece of cardstock. One of the best things I have done is I bought a few of square, clear containers (sandwich size) and tipped my embossing powders and glitters into them. I have labelled each container and put a plastic spoon into each. When you go to emboss or glitter a project you just hold your piece of cardstock over the container and spoon over the powder. The excess drops straight back into the container or can be easily tapped off the cardstock, ready to be used again and with NO MESS!! It's so easy not to have to the tip the excess powder back into another container small jar. Sorry don’t have any tips as my organisation is non-existent! I do have some carry tool boxes that I put everything in to take to a class or workshop… I suppose that’s organisation! Do you have any questions you'd like to ask our talented Design Team? Post them in the comments section and we'll see what we can do! If you haven't already entered, the cut-off time is Wednesday 17th March at midnight EST and you can submit your entries HERE. Welcome to Just Add Ink week number 9! This week we have a sweet little sketch for you to interpret as you like, and as always we're super excited to see what you come up with! Interpret the challenge in anyway you like - you can make a card, scrapbook page, 3D project, etc. While the DT uses Stampin' Up! products exclusively, you're welcome to use any brands you like. Please use the keyword JAI9 when uploading to public galleries. Provide a direct link to your post where you've displayed your creation using Mr. Linky - not your blog in general. Incorrect or bogus links WILL be deleted. Click here for more information. Mr. Linky will close Wednesday 24th March at 11.59 WST. Be here on Thursday 25th March to see our Top Picks from this round. Can you believe we're 3/4 of the way through March already? Easter and school holidays go hand in hand, and are just around the corner. We have taken steps to encourage you all in those busy weeks to bribe your kids with something sugary and the latest Pixar movie, so you can get a little peace and quiet and craft ... and enter our challenges over the holiday fortnight perhaps?? Yes, folks - we're talking PRIZES!! Two weeks, two challenges, and two prizes coming up soon for 2 lucky winners (AU/NZ only), so make sure you stay tuned for that in the coming weeks. Congratulations to everyone that entered this week, every single entry was special and beautiful in it's own unique way. Thanks for playing at Just Add Ink, see you tomorrow for our sketch challenge reveal!! If you haven't already entered, the cut-off time is Wednesday 17th March at midnight WST and you can submit your entries HERE. And just a friendly reminder - when you're linking your project, please make sure that you submit the DIRECT LINK to your entry and not your blog address. We hate deleting links to gorgeous work! Can't Live Without... Kitchen String! Now that you're all familiar with the way our challenges work, we're kicking off the other features of Just Add Ink. If you haven't already seen the first My Space featuring Jodene Tripp's space, make sure you check it out! I thought I'd share what I can't live without, but when I really thought about it, there are so many things I use constantly! So I'm sharing my favourite Can't Live Without product, which at the moment is plain, humble Kitchen String! 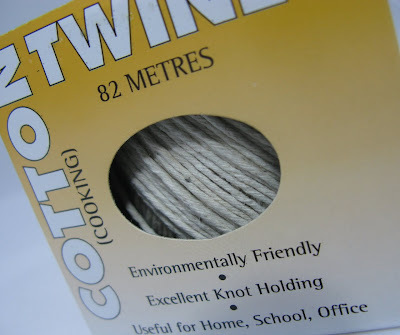 I use kitchen string on so many different projects, from cards and boxes, to scrapbook pages and handmade embellishments. I love it! It has a rustic look about it, it's cotton so it's gentle to use, and best of all, it's CHEAP so I don't stress out if I waste some. The roll I've photographed was bought at K-Mart for $3.00 for 82 metres - that's 3 and a half cents per metre. No wonder I seem to be favouring winding it around my cards three times! And there you have it! It's not the most exotic product, but it's my favourite. :-) I'd love you to leave a comment if you have any ways that you use kitchen string - we love to share ideas! Would you like to share your Can't Live Without product or technique? Just send us an email at just-add-ink@hotmail.com and you might find your product/technique featured here! In the subject line of your email, please put "Can't Live Without and the name of the product/technique". Please include your blog/website address (if you have one) so we can link your site to your post. Feel free to include a couple of photos (but it's not necessary). Please double check all the information you submit - we're can't guarantee that everyone's submissions will be published, but if yours is, it will be published exactly as you've written it! There are no set days or times for this section for publishing, so you might submit something one day and find it on here that afternoon... or it might be a month before you're featured. Just keep that in mind! I think you can tell how close Easter is by the number of various shaped and themed chocolates beckoning to you from every other shelf as you wander through the shops to grab a few things. Christmas Eve: there were a few chocolate eggs here and there. Now it's like the bunny's have been ... well. You know. Please use the keyword JAI8 when uploading to public galleries. Mr. Linky will close Wednesday 17th March at 11.59 WST. Be here on Thursday 18th March to see our Top Picks from this round. 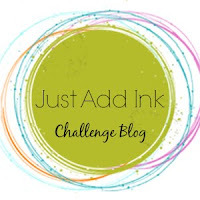 Just Add Ink Challenge #7 - A Colour Challenge! JAI6 - Entries So Far!